Adlai Ewing Stevenson II (February 5, 1900 – July 14, 1965) was an American politician. He ran against Dwight D. Eisenhower in the 1952 and 1956 elections, but he lost. He was the grandson of Vice President Adlai E. Stevenson. He was also the 31st Governor of Illinois from 1949-1953. He became United States Ambassador to the United Nations from 1961 until his death in 1965. Stevenson was born in Los Angeles, California  to Lewis Stevenson and Helen Davis Stevenson. His maternal great-grandfather Jesse W. Fell was a close friend and campaign manager for Abraham Lincoln. 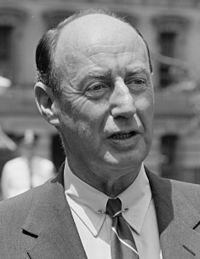 His oldest son Adlai Stevenson III became a United States Senator from Illinois from 1970 until 1981. He grew up in Bloomington, Illinois. He studied at Bloomington High School until his junior year. After that he went at University High School in Normal, Illinois. Then he studied at Princeton University and Northwestern University Law School. He ran for president six times which were 1940, 1944, 1948, 1952, 1956, and 1960, lost the Democrat primaries to Franklin D. Roosevelt, Harry S. Truman and John F. Kennedy. He also lost the 1952 and 1956 elections to Republican Dwight D. Eisenhower. Stevenson was Governor of Illinois from January 10, 1949-January 12, 1953. He married Ellen Borden in 1928 and divorced in 1949. Stevenson is a second cousin, once removed of actor McLean Stevenson. His son is former Illinois Senator Adlai Stevenson III. In 1953, he was elected a Fellow of the American Academy of Arts and Sciences. In 1957 he went back to law practice. He was employed part-time by Encyclopædia Britannica. Stevenson tried to run for the nomination in the 1960 election. He lost to Senator John F. Kennedy. Stevenson refused to give the nomination address to John F. Kennedy. After Kennedy won the nomination, Stevenson campaigned for him. He was appointed Ambassador to the United Nations in 1961. Stevenson's most well-known moments happened during the Cuban Missile Crisis when he gave a presentation at an emergency session of the Security Council on October 25, 1962. Stevenson suffered a heart attack on the afternoon and died later on July 14, 1965 in London of heart failure. The funeral in Bloomington, Illinois Unitarian Church was attended by President Lyndon B. Johnson and Vice President Hubert Humphrey and Supreme Court Chief Justice Earl Warren. ↑ "Adlai Stevenson". Unitarian Universalist Historical Society. Retrieved December 15, 2012. ↑ "Historic-Cultural Monument (HCM) List, City Declared Monuments" (PDF). Retrieved December 15, 2012. ↑ "'MASH' star McLean Stevenson dies". CNN. February 16, 1996. Retrieved December 15, 2012. ↑ "Book of Members, 1780–2010: Chapter S" (PDF). American Academy of Arts and Sciences. Retrieved December 16, 2012.